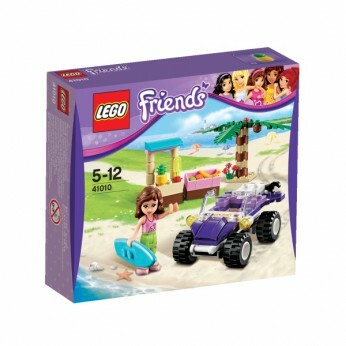 Lego Friends Olivias Beach Buggy features purple Beach Buggy with a wrench and real rubber tires. Includes Olivia mini-doll figure…. Have fun at the beach with Olivia and her fab new purple beach buggy! The accessories include a tall leafy palm tree, a surfboard that can be attached to the back of Olivia’s buggy and a beach stand with an ice pop and fruit. Everything you need for a sunny day out! Collect all of the Lego Friends for a whole world of fun! LEGO model number: 41010: Includes Olivia mini-doll figure; LEGO Friends pieces are fully compatible with all LEGO system bricks. One supplied; Size H14.1, W15.7, D4.5cm; Weight 0.11g; For ages 5 years and over; EAN: 5702014971691. WARNING(S): Not suitable for children under 3 years old. Only for domestic use; To be used under the direct supervision of an adult. This toy costs approximately £9.99 (for the latest and best prices make sure you check our retailer list for the Lego Friends Olivias Beach Buggy 41010 above). In our review of Lego Friends Olivias Beach Buggy 41010 we classed it as being suitable for ages 6 years, 7 years, 8 years, 9 years, over 10 years but recommend you check the manufacturer specific advice before purchasing.